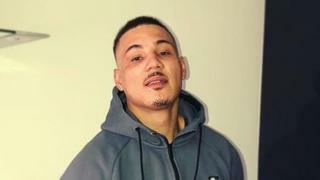 Two brothers have been handed life sentences for murdering a drug dealer in a "frenzied assault". Courtney Jones, 26, died in hospital after being stabbed, stamped on and hit with a brick outside a friend's house in Totton, Hampshire, in August 2018. Sid Cooper, 26, admitted inflicting the fatal knife wounds but told Winchester Crown Court he acted in self-defence. He and his brother Charlie, 19, both of Ashby Road, Totton, were found guilty on Friday after a two-week trial. Sid Cooper was told he would serve a minimum of 18 years before being considered for parole. Charlie Cooper will serve a minimum of 15 years. Image caption Sid Cooper (left) and his brother Charlie set upon their victim "like a pack of wolves"
Mr Jones, who was from Wolverhampton but was living in Sheffield, was attacked as he left the house in Salisbury Road at about 19:45 BST on 25 August. The brothers set upon him "like a pack of wolves", the court was told. Prosecutor Adam Feest QC said it was a "frenzied assault... [in which] Mr Jones was stabbed at least twice, causing severe and rapid blood loss". He said the brothers cut a bag of drugs and money from the victim's body before running off. Sid Cooper was later arrested near Testwood Farm travellers' site, and immediately taken to hospital after he began to fit and vomit blood, the court heard. He told the police he had taken cocaine and traces of the drug were found on his clothes and body. He said Mr Jones, who he knew as "Timmy", had attacked him and Charlie with a knife. He also told a neighbour: "I had to do him. He was selling drugs to my 14-year-old daughter." Mr Feest said the motive for the killing was not clear. Det Supt Tim Rowlandson said Mr Jones' partner and child would "live with the effects of this incident for the rest of their lives".